You may remember the movie Friday Night Lights. You know, the movie about the texas football team that had the highs and lows and the big motion picture behind it based on the true story? It`s now a TV show if that helps. Ring a bell yet? 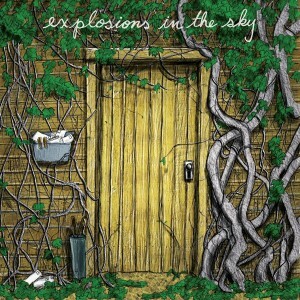 Well if you didn`t know, the soundtrack from the film was a beautiful masterpiece created by this band Explosions In The Sky. The warm instrumental and moody music was perfectly placed in the film and created the landscape of mostly sadness and despair. The band performs their music so well, all of their songs could be featured in movie soundtracks and I`m really surprised it hasn`t be so far. I know this isn`t your typical band that you see reviewed on this site but this is a great band that deserves your attention. As an album reviewer I try to review all styles of music and genres so your not hit will all the same music and the same words. There`s only so far you can go with the same styles of music and words backing them until your hit with something that will make you keep writing uncontrollably. This album does that. It creates delicate, ambient sounds as the band is known for. Only six tracks on the record still spanning over 45 minutes. Some of the tracks can get a little long and monotonous sounding at times but thats what you get when your wrapped up in the mood of the music. I think the album would be more appetizing to the main audience if the songs were shorter but then they would be compromising their art so who really knows, this is what the Texas-based boys do best. The sound the band gets from their multi-talented musicianship is incredible and delightful. The album will be enormous one minute, you cant even think, then be so delicate the next you can hear a pin drop. If your into the bands like Sigur Ros, Mogwai, or Caspian then this band will be right up your alley. Even though the band is relatively young, they have garnered popularity beyond the rock scene for their cinematic, elaborately developed guitar work, narratively styled instrumentals, and their enthusiastic and emotional live shows. They primarily play with three electric guitars and a set of drums, and at times a bass guitar. Odd yes. but creative. Although the band`s music deviates from pop, they have similar goals like immediately grabbing your attention and getting to your emotions. So Long, Lonesome is the most Sigur Ros-like in the way that the whole song builds up into an almost messy euphoria of huge sound and ambiance. If you have not checked the band out. You should. Just for the mere fact that the music they create is enormous and even more emotional than a band with a vocalist. How is that possible, you ask? Just listen to the music and it will take you on the journey through mountains, skies, and oceans. You will feel like your riding through clouds and the open air and at moments will bring you to peace and love and other moments of life reflections all in this instrumental record. Explosions In The Sky delivers once again with their ambient, soulful display of instrumental ambiance and pure hearted rock.